Nubia is a company which might not be very popular in the global market, but it is well-known in the Chinese market. Last year, the company launched Nubia Z17 and Z17s in the Chinese market with some impressive high-end specifications, but the phones didn’t make it to the global market. 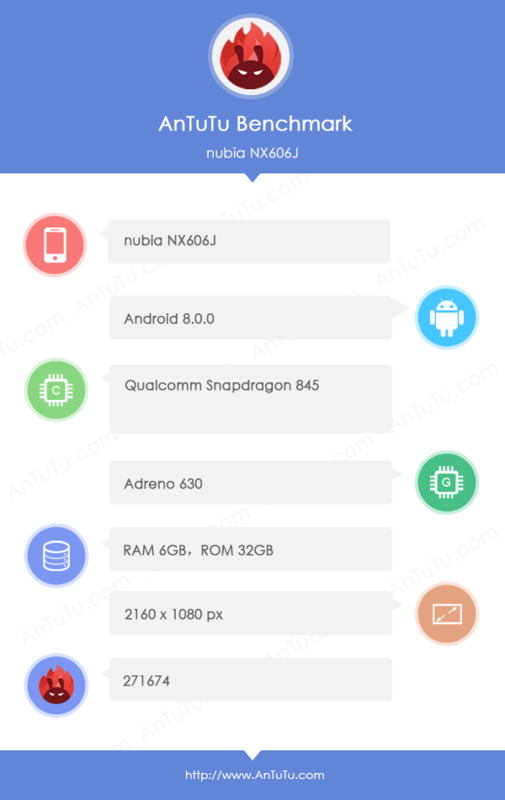 This year also, Nubia is preparing to launch a high-end smartphone and today, Nubia NX606J showed up on AnTuTu benchmark that revealed some of the specifications and also the AnTuTu score. Well, as the image above reveals, it is going to be a high-end flagship smartphone featuring the latest Snapdragon 845 processor along with the Adreno 630 GPU. It looks like there is a mistake in storage as this is a very weird combination of 6GB RAM along with just 32GB ROM. Nubia launched its last year’s flagships with 6/8GB RAM along with 64/128GB ROM, so we are expecting to see the same combination this time also. Rest of the specs include an 18:9 display with Full-HD+ resolution (2160x1080p) and Android 8.0.0 Oreo. The Nubia NX606J scored 271674 on AnTuTu which is so far the highest score by any smartphone. The Samsung Galaxy S9+ was also spotted on AnTuTu recently, but that too scores lesser than the Nubia NX606J. So, Is Nubia preparing to launch a powerful high-end flagship? We have no information regarding the launch date or the global availability so stay tuned for that.